Stan Lee once commented that comics didn’t present change but rather the “illusion of change,” that even though things appeared to be different, nothing really changed and everything would be back to normal. Peter Parker could quit being Spider-Man for an issue or two, but then would have to put on the suit again; the Hulk would be accepted by the Avengers and the public for an issue, but then decide to run away; this was how the status quo was maintained. But, over the years, change did happen. The illusion of change often wasn’t enough — if you knew nothing was going to be different at the end of the story, was there any real danger to the characters? So, in fact, the characters in comics did change. Some died. Some changed their superheroic identity. Two villains, Colonel Future and the Wizard, contrive to erase Superman from existence. What this manages to do, however, is erase the Superman persona from existence and leave only Clark Kent (unaware he is Superman) behind. Without the knowledge of being Superman, Clark works diligently as a reporter for the Daily Star and also dates fellow reporter Lois Lane, up until the point where he proposes marriage. And then they get married. After his memories are restored by Lois (and the villains defeated), however, Lois tells Superman that it’s okay that their marriage is over, that the world needs him as Superman more. Oh, right, I forgot to mention that this was the Earth-Two Superman and Lois. Because by this point in time, the DC Universe had been divided into the Silver Age Heroes (who were on Earth-1) and the Golden Age Heroes (who were in Earth-2), Cary Bates and Curt Swan knew that they could marry Superman off permanently and still have an unmarried Superman to fall back on. They could, in fact, permanently change one Superman and leave another Superman untouched. They did this all because it was the 40th Anniversary of Superman and they wanted to do something special. Finally, however, in 1996, Lois and Clark got hitched. I’ll admit, I own “The Wedding Album” and I like it, even if it is not a good story. The Superman writers had been trying to get Lois and Clark married for years and were stymied time and again by various factors, mainly the Lois and Clark television show, which also teased marrying off Lois and Clark before showing it to be a fake out (so much so that the episode where it did happen was called “Swear to God, This Time We’re Not Kidding”). There was no going back on this, too: unlike the previous marriage, this was the mainstream Superman. But Clark and Lois had been in such a long relationship that, all in all, this seemed like a natural progression — it was change that worked. Superman and Lois would stay married through thick and thin, through horrible ‘90s costumes (oh god Blue Electricity Superman) and Brainiac 13 turning Metropolis into a literal City of Tomorrow and Luthor becoming President and so on. In fact, the status quo of a married Superman stayed the same (even though other changes came and went) until 2011 and the reboot of the DC Universe into the New 52 erased their marriage. Over in Marvel Comics, Spider-Man had, in fact, gone through pretty much the same thing, only his life had started out as a “superhero soap opera,” rather than simply turning into one as Superman’s had. Peter Parker had suffered ups and downs in his life and his first love, Gwen Stacey, was even permanently killed off. But after years and years of getting together with Mary Jane and then breaking up and then getting together again, writers knew that something new had to happen. So in 1987, Amazing Spider-Man Annual #21, simply titled “The Wedding!”, was released. Written by David Michelinie and Jim Shooter and illustrated by one of the definitive Spider-Man artists John Romita, in this issue, Spider-Man and Mary Jane Watson get married. And that’s it. No supervillains attack, nothing horrible happens to stop the wedding, they get married despite both of them having reservations and things turn out good. Two superheroes, both married to their long time love interests, their marriages lasting for years and years, now suddenly single due to the machinations of writers. Perhaps this is what Stan Lee meant — that even though there can be change, it can always be rolled back, that change undone by someone who likes their superheroes unmarried. And sometimes those reversions are, themselves, reverted. In 2015, DC Comics had a two month crossover called Convergence to cover their move from New York to Burbank, California. Convergence’s main story was fine, but it was in the tie-ins that it shone: all of the tie-ins were love letters to every single previous version of the DC Universe, from the Charlton Comics characters to the Captain Marvel family to the “Bwahaha!” version of the JLI to the pre-New 52 DC Universe. 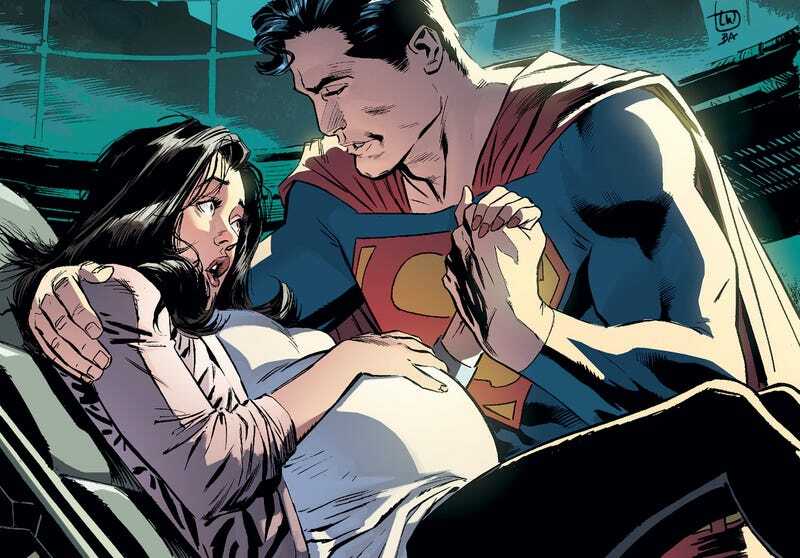 In fact, this two-issue mini-series proved to be way more popular than anticipated, so after the end of Convergence, the pre-Flashpoint Clark and Lois and their son moved over to the New 52 DC Universe, so that stories could be told of a married Superman with his wife and son, as well as an unmarried Superman to fall back on. The more things change, right? Suddenly, having a Superman of Earth-1 and Earth-2 doesn’t sound so confusing, now does it? And although the New 52 Superman died just prior to the Rebirth relaunch, this change has, so far, stuck. For now. Over in the world of Marvel, however, pretty much the exact same thing happened. Sort of. While DC’s crossover for 2015 was Convergence, Marvel had a much bigger crossover: Secret Wars. However, again, it was in the tie-ins where it really shone and one of those tie-ins was Amazing Spider-Man: Renew Your Vows, a five issue mini-series about a married Peter Parker and Mary Jane and their daughter, Annie May Parker. Because it was a longer story (five issues to Convergence: Superman’s two), it was able to take a longer approach, telling a bigger story about Peter and MJ trying to raise their daughter in a world ruled by a supervillain called the Regent. It still ended happily, however, with the Regent defeated and Peter, MJ, and Annie able to live without fear of capture. Renew Your Vows was written by the main Spider-Man writer Dan Slott, who had apparently wanted to bring back the Spider-marriage for awhile, even through people’s objections. Finally, they settled on Renew Your Vows as a compromise, letting him show one Peter Parker as happily married with a daughter, while still have an unmarried Peter to tell main stories with. Unlike the pre-Flashpoint Lois and Clark, however, the Renew Your Vows Peter and MJ won’t be moving into the new universe, but rather staying in their own, much like the Earth-65 of Spider-Gwen. That doesn’t mean that the main 616 Spider-Man will forever stay unmarried. After all, if there’s anything these changes have shown, it’s that we just have to wait awhile.